Each time I try to persuade people that such a thing is possible, I do it in a comical, sometimes self deprecating way because anyone who knows me knows I am not a very athletic guy. Despite the winter chill outside (most Kitsap areas didn’t get out of the 30s today despite the brilliant sunshine) spring sports have started at Central Kitsap High School and I decided to try my hand at some of the sports, starting with track. Though this video is a parody, it’s sadly not very far from the truth! Ok, let’s move on to the weather forecast. In the video you probably heard me talking about the chance for a rain/snow mix overnight Saturday. There is indeed that chance as a new wrinkle suggests a convergence zone could form Saturday night dropping the snow level below 1,000′. Don’t get concerned about that yet as the weather models are just as flaky as the snow itself. Tomorrow through Friday morning looks beautiful with similar weather to today: partly to mostly sunny with highs in the mid 40s to lower 50s. And then…BAM!…the clouds and showers move in for the latter part of Friday through the weekend. 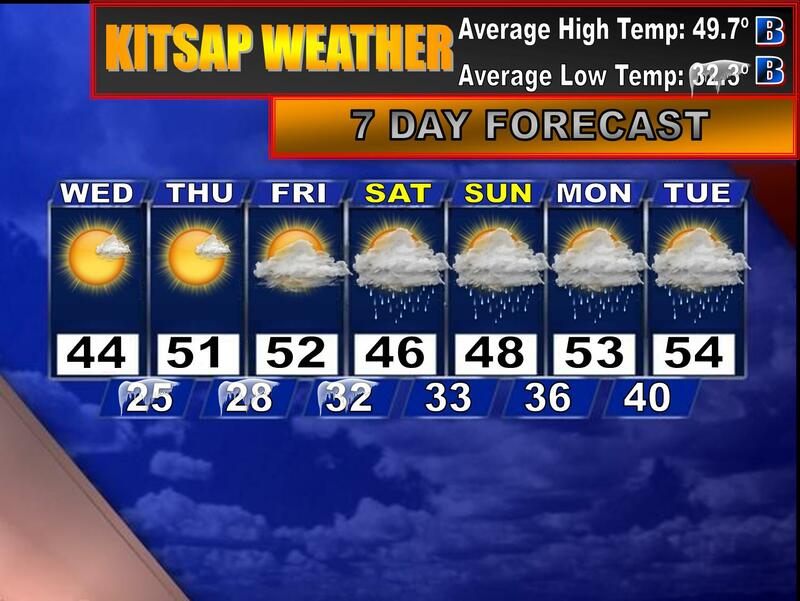 Highs will be cooler as well with highs by Saturday into the mid 40s. The long range model variability continues as now early to mid week next week looks cloudier with more showers. The temperatures, however, still look mild with warm, southerly flow rushing into the region. Better hit the slopes while the weather is still cold! Cliff Mass, respected UW Atmospheric Sciences Professor, weekly KOUW radio guest, and author of “The Weather of the Pacific Northwest” will be at the Eagle Harbor Book Company which is located at 157 Winslow Way East, Bainbridge Island, a short walk from the Seattle Ferry. This event will be on Sunday, March 15th, 2009 at 3:00 PM and is a multi-media event explaining the intricacies of Pacific Northwest weather and there will be a question and answer period after the presentation. The event is free and open to the public so if you have some extra time Sunday, go check it out!